Policing is on the agenda again in episode 14. In this episode I talk to Andy Priest about his international rapid intervention concept that focuses on providing advanced police support during critically destabilizing events. Andy stresses the importance of building this capability now so that participating nations can draw on a stabilizing resource in an inevitable crisis rather than over-reacting, over-reaching, or stretching existing resources to the breaking point. It’s an important concept that will only get more important if the threat of Charlie Hebdo style attacks (or other destabilizing attacks) scale up in impact and frequency. Preserving individual liberty could prove challenging in such an environment and Andy makes the case that clearly segregating the roles of police, military, and specialized response forces is work that should be occurring now – before the crisis. You can follow Andy Priest on Twitter @Priestic1. Andy blogs at https://medium.com/@Priestic1. 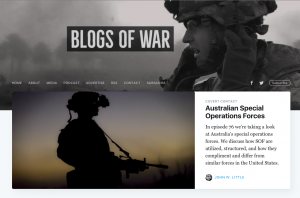 In episode 13 I speak to security blogger/podcaster, and Blogs of War contributor, Scriven King about some of the challenges in modern policing. Security professionals, police included, are scrambling to understand rapidly evolving technologies and threats. Evolving to meet those threats, and leverage those technologies, without significantly changing what it means to be a police officer, without undermining the ideals of the profession, and without permanently damaging public perception of the profession is proving difficult. Even greater challenges loom on the horizon so the time for serious apolitical dialogue is now. You can follow Scriven on Twitter @ScrivenLKing, listen to his security podcast, The Gate Shack, and read his thoughts on security at his blog, The Security Dialogue.